The first rumors of it surfaced in December on a lifestyle magazine's blog. A few weeks later, it was spotted in the arms of runway model Hollis Wakeema in a Las Vegas hotel. Then came its Web site: Black and white fashion photos fade in and out as cool piano notes drop and melt into a warm, smooth beat. Prepare to fall in love, the site reads. Now, go buy the laptop. 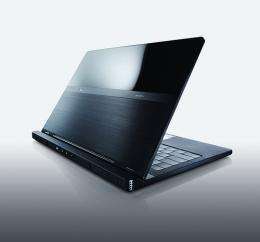 Specifically, Dell Inc.'s new $2,000-and-up laptop. The computer maker was entering the ultra-thin notebook race Tuesday with the Adamo, from the Latin for "to fall in love with." The aluminum-body laptop comes in two colors, "onyx" and "pearl." It boasts a 13-inch screen and, with a depth of less than two-thirds of an inch, is thinner than both Apple Inc.'s 0.76-inch MacBook Air ($1,800 and up) and Hewlett-Packard Co.'s 0.7-inch Voodoo Envy notebook (from $1,900). Even the customer support package goes upscale. Dell will guarantee the same team of service representatives for $99 for a year or $349 for three. Dell, known for affordable, no-frills computers, leaned away from consumer-electronics tropes and toward the seductive imagery of couture as it designed a marketing campaign to fit the Adamo. The leap Dell is asking consumers to make from its core brand would be a risk in any economy, let alone the worst recession of the personal-computer age. PC sales are sliding and the lone bright spot in the market appears to be small, inexpensive "netbooks," Adamo's polar opposite. Round Rock, Texas-based Dell reworked its consumer PC lineup about two years ago, shortly after ceding market leadership to Hewlett-Packard. Dell had fallen a few steps behind partly because people started craving gadgets with flair. Meanwhile, Apple was nurturing consumers' love for their iPods and using that connection to sell them well-designed laptops, too. Dell knew it needed to "bring more brand lust and more got-to-have kind of products into the mix," said Michael Tatelman, the company's vice president of global consumer sales and marketing. The new consumer team, led by Ronald Garriques, a former Motorola Inc. executive, mapped a tiered strategy that ranged from the value-conscious Inspiron laptops to powerful, expensive - and vaguely menacing-looking - Alienware machines for gamers. As Dell began plugging what Tatelman called a hole at the high end, designers from inside and outside the company were pitching blueprints for computers that didn't fit into any of the existing Dell lines. So once the design was hashed out, Tatelman and his team worked with Enfatico, an agency built just for Dell by global advertising conglomerate WPP Group PLC, to figure out how to sell it. Dell declined to say how much the company spent on the Adamo campaign, but Tatelman said it "ranks among the bigger product launch campaigns that we do." Tatelman's team penned a brief manifesto to be used as inspiration as the campaign took shape: "Love. Life begins with it. Ballads celebrate it. Battles start over it. Lives are changed by it. Some will die for it. There are no rules for it. Some will never find it. Others never lose it. We were inspired by it." The resulting Web sites, magazine advertisements and other promotions would be unrecognizable as a technology ad campaign were it not for a "by Dell" tag line. "This is a bit more experiential than just a story about a PC. The craftsmanship of this product is more like a fine watch or jewelry," Tatelman said. "I'd like to think that someone getting a gift of a pearl Adamo for an anniversary would be ... proud to get that kind of gift." While some industry watchers were disappointed by the scarcity of details, Dell's move had the intended effect of building buzz. The company said its Adamo Web site has logged 800,000 unique visitors in the past month, and that about 15 percent have entered an e-mail address to learn more. Tatelman seemed unfazed by the challenge of launching a luxury brand in a brutal financial environment. Dell's outlook for Adamo sales is "very modest," Tatelman said, and added that a primary goal is to broaden people's perception of Dell from its value-conscious roots. David Reibstein, a marketing professor at The Wharton School of the University of Pennsylvania, said at first he thought the Adamo teaser site, with its seductive images and music, was promoting a new cologne. "Part of that is going to catch people's attention. It's hard to get recognition in this day and age with your latest laptop, particularly when you're coming in as a follower with the ultra-thin," Reibstein said. He said he understands Dell's attempt to get people to connect emotionally with Adamo; that's what would push them to buy Dell over another brand. But he pointed to two things working against it. Not only is this a terrible time for a luxury-brand launch, but the PC maker may have a hard time gaining credibility for a high-end product that still carries the budget-friendly Dell name. He compared the move to Marriott International Inc.'s decision to keep its name away from its Ritz-Carlton hotels, or Toyota Motor Corp.'s choice to launch Lexus as a separate brand. Adamo could work with time and patience, Reibstein noted - two qualities in short supply in the tech industry. Why would Dell want to join Apple in its march toward oblivion? Apple products are way, way over priced. Apple products are for children. If Dell thinks they can make money selling overpriced products then they should expect to lose money, even die as a company. I've tried shopping Dell online and laughed at the prices. It really is not hard to put a motherboard in a shell along with what you want your PC to do, and cheaper. Children, eh? Hmm... I've always thought most graphics designers and composers I met were a little childish. Now I know, I guess. Thanks for clearing that up Bob_B. I wouldn't have wanted to accidentally buy a fast, ridiculously stable workstation. Sure, they were sucked in Mac's a long time ago. My comment about Dell stands. Why is Apple losing more shares? You graphic designers need to actually stop looking at color and look at the price tags. It was mentioned they (Dell) need to "get people to connect emotionally" which is the only way Apple markets its products, and many of them are aimed at children, sorry if you believe differently. I really don't need an emotional attachment to my PC, and I will say again, I will never own any Apple product that is so overpriced. It is funny, as a PC owner I've never had any issue with a virus, or crashes or equipment failures, or speed while using my graphics apps (Photoshop, Painter 10, etc. ), well OK the fractals can take a few minutes to generate, but even on a Mac they take time. Capturing tracks of music is a real time operation and is not a problem for either Apple or PC's to grab the data for storage. Now, that we are not living in the early 1980's, the Mac speed is what, equivalent to today's PC's? Or conversely, PC's are just as fast as a Mac - and cost less. The dream has ended, Apple is just charging an arm and a leg. If you can afford it and like to fool yourself, go for it!